All three events are members and partners of world associations; travel, tourist film, tourist journalism, landscape, ecology and sustainable development; FIJET, FEST, ITCO, CiB. 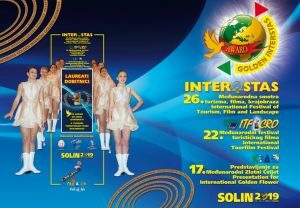 With the support of these world associations and the host of Hotel President Solin, all three events are held under the patronage of the Split-Dalmatia County, Town of Solin, and with the high patronage of the Croatian Parliament and the President of the Republic of Croatia, Mrs. Kolinda Grabar-Kitarovi?. The event begins on Wednesday, November 13th at 6pm with a commemorative program, at 7pm the ceremony of raising the flag, then a retrospective of the films awarded at the recent Tourfilm Festival — ITF’CRO. On Thursday, November 14th from 10am; continuation of the work of all three events, protocol and work presentation of the Exhibitors / Laureates — winners of International tourist awards and prizes; KEA-CRO, THE FEST AND THE GOLD INTERSTAS ‘2019. The closing ceremony of the entire event is on Friday, November 15th from 7pm, with the award; Certificates for Croatian competitors for INTERNATIONAL GOLDEN FLOWER — CiB, special awards “Dr.Luka ?ikeš”, International tourist awards: FEST ‘2019. and GOLD INTERSTAS ‘2019 and the film festival awards, certificate and Grand Prix for 22nd ITF’CRO 2019. Per Programmes.